Over the holidays, Genevieve Valentine blogged about her long-awaited next novel: it's called The Girls at the Kingfisher Club and I'm really very keen to read it, though it looks and sounds very different from Mechanique: A Tale of the Circus Tresaulti. Jo, the first born, “The General” to her eleven sisters, is the only thing the Hamilton girls have in place of a mother. She is the one who taught them how to dance, the one who gives the signal each night, as they slip out of the confines of their father’s townhouse to await the cabs that will take them to the speakeasy. Together they elude their distant and controlling father, until the day he decides to marry them all off. The girls, meanwhile, continue to dance, from Salon Renaud to the Swan to the Funeral Parlor Supper Club and, finally, the Kingfisher, the club they come to call home. They dance until one night when they are caught in a raid, separated, and Jo is thrust face-to-face with someone from her past: a bootlegger named Tom whom she hasn’t seen in almost ten years. Suddenly Jo must weigh in the balance not only the demands of her father and eleven sisters, but those she must make of herself. 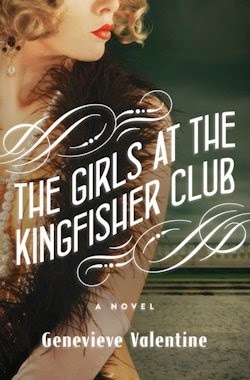 With The Girls at the Kingfisher Club, award-winning writer Genevieve Valentine takes her superb storytelling gifts to new heights, penning a dazzling tale about sisterhood, freedom, and love in Jazz Age Manhattan. I can't say I'm sorry Valentine seems to be done with steampunk—for the time being, at least: it's not a form I've ever been awfully fond of, and though she incorporated its central tenets marvellously in Mechanique, these same ideas seemed to me nearly meaningless in her terse but tender novella Terrain, which I just read for the Short Fiction Spotlight over on Tor.com. The Girls at the Kingfisher Club is due out—in the US, I should stress—from Atria Books in June. I couldn't locate your contact information so I have posted here. My name is David Meredith and I very recently came across your book blog. I have just released a novel - The Reflections of Queen Snow White - on Amazon.com in the Kindle Store this past October and would be happy to send you a complimentary copy if you would be interested in reviewing it. I have included the dust cover synopsis below. If you are interested, just reply to this e-mail and I will happily send you your free copy right away. Thank you for your time and I look forward to your response!